We're just a few days away and what we suspected would happen with the final qualifying event for the 2014 OPTIMA Ultimate Street Car Invitational (OUSCI) has happened- a huge field of competitors, hoping to scrap and scrape their way into the 2014 SEMA Show and the OUSCI...and more than a few that may end up playing the role of spoiler. More than 50 cars have already registered for the event and if this event holds true to form, we'll probably see a few more sign up in the coming days. A large field could be good news or bad news, depending on which side of the points fence you are on. A large field is bad news for anyone looking to get in on points at the event, as the larger fields tend to dilute the points available to competitors in that field. It's great news for those looking to stay in on points, as there is less of a chance they'll get knocked out by someone emerging from a large field of competitors. If we look at GT2K (under 3000 pounds), Joe Escobar's Pinto is perched atop the standings with nearly 400 points on the season. The only competitor who has a mathematical chance of catching him is Californian, Ken Suen, who is not signed up for Pittsburgh and unlikely to attend. However, two other competitors could play spoiler in GT2K- Herman Porter and Bradley Yonkers. Porter wasn't even on anyone's radar in the Ultimate Street Car Series, until he ran at the Sebring event. However, he now has 103.53 points. If he duplicates that total at the double-points event at Pittsburgh, he'll have more than 310 points, which could earn him a trip to Las Vegas. The same may be true for Bradley Yonkers, who ran his Corvette previously at the Michigan USCA event. If he repeats his performance, he will also end up with more than 300 points on the season and could make the field. The smaller the GT2K class is, the more likely those drivers will be to score more points and finish higher in the standings. The same is true for the AWD class, where Shawn Carroll has a narrow lead over Justin Stone with 312.23 points. Narrow because Justin is signed up to run at Pittsburgh and Carroll is not. Stone has only run in two other events, so if he finishes at Pittsburgh, it will likely catapult him to the top of the standings, regardless of where he finishes in the event. There are currently four vehicles signed up for the AWD class and while Larry Woo's Porsche may be considered a front-runner to win the class, due to his previous performance at Michigan, that is far from being decided. Michael Vida is a first-time competitor in the USCA, but he has extensive track day experience, as well as time attack, high-speed autocross experience, ice racing and wheel-to-wheel racing in the ChumpCar World Series. Very little is known about another first-time competitor, Adam Baumel, but he is showing up in a 514-horsepower Audi TT and could be serious competition. Those hoping to get in on points will want to see Woo win the class, as that will then qualify him for the OUSCI, without having him take a position in the top-20 in points. If someone other than Woo wins and he simply repeats his performance from Michigan, he'll end up with more than 322 points, which may be enough to get him into the field on points (there are 11 non-qualified competitors already with 300 or more points). At that point, would Shawn Carroll's 312.23 points be enough to stay in the field? We'll have to see how that plays out in Pittsburgh. On the GT3K side, things look even tighter. We heard Ken Thwaits had originally intended to run his Z28 at Pittsburgh, which already qualified for the OUSCI at Road America. However, upon learning that Kyle Tucker, James Shipka and Chris Porter, who all have a mathematical shot of catching Thwaits in the overall points chase, were all registered, he reverted to his yellow 1LE Camaro, which has not yet qualified for the OUSCI, but will on points, regardless of the outcome of this weekend's event. All four of those drivers will have the points to qualify for the OUSCI, but for them, it's all about the championship chase. That championship chase is bad news for everyone else looking to score points to get in, because all four are obviously very strong competitors, who will likely consume some much-needed points at Pittsburgh. How many points Pittsburgh competitors can score is still to be determined, but looking back at some of the past events, we can see what history has shown us. In the larger GT3K class, Danny Popp has scored as many as 120 points at Gateway, which would translate to 240 for the double-points event at Pittsburgh. That many points would likely result in a class win and automatic invite, but it is not unreasonable to think a good performance in the GT3K class at Pittsburgh could be worth 200 points or more. The GT2K and AWD classes are a little different, as their smaller sizes tend to keep the points level fairly high for all competitors involved, with even the backmarkers capable of earning 200 points in Pittsburgh. As we mentioned before, that could make competitors like Woo, Porter and Yonkers spoilers for GT3K competitors who are scrambling for any and all points they can get right now. 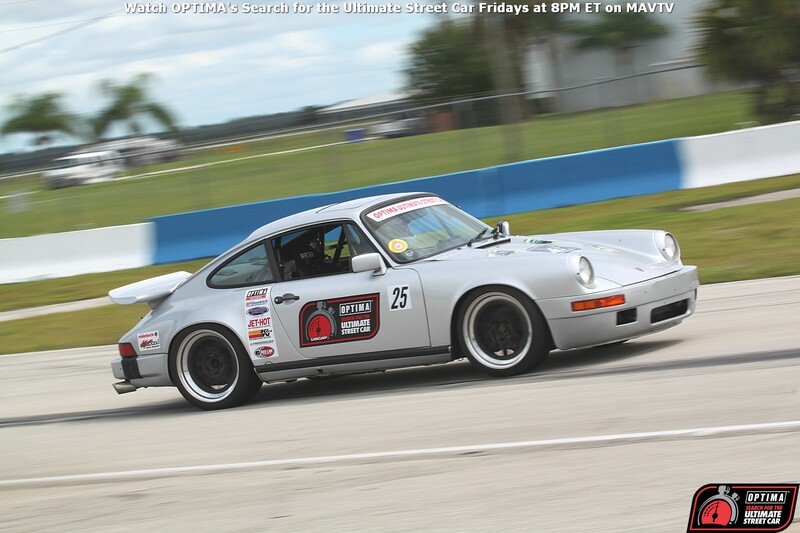 GT2K competitor, Brian Nutter is a past OUSCI competitor and James Forbis is a three-time NASA National Champion. Either one could win their way in at Pittsburgh and depending on how Yonkers and Porter ran, those two could get to the OUSCI on points. The GT3K class in Pittsburgh will basically shape up like the GT2K class, multiplied by about ten. The resumes of those competitors are littered with national championships, licenses to race in a wide variety of series and some of the competitors themselves are driving instructors at high-performance driving schools. Many have already won USCA events this year and the scary thing is, they represent only a fraction of the incredible talent and machinery that will be on display at the SEMA Show and OUSCI. Pittsburgh is going to be a wild one and you won't want to miss it! Buy your Pittsburgh spectator tickets today and don't forget to snag your tickets for the 2014 OPTIMA Ultimate Street Car Invitational in Las Vegas while you're at it!